A visit to Robin Hood's Sherwood Forest is an experience. Robin Hood was outlawed for his deeds and beliefs in a time when the rich grew richer and the poor poorer (sounds familiar!!). 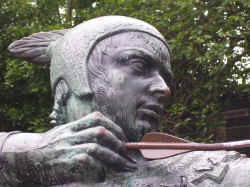 He and his merry men spent their time living off the land in the forests and scrublands in the UK, avoiding capture and occasionally robbing from the rich to give to the poor. The stories of the legend have been passed down from generation to generation, embellished and questioned. There are books written that make him out as a short Welshman others that question his existence at all, but the stories tally so well with findings of caves in Nottingham Castle and the other major landmarks, that there can never really be any doubt - and whilst some say he was in other parts of the Country, he spent most of his time in the Forests of Nottinghamshire. Buy online...>>> He did however travel to avoid capture, his appearance in other parts of the country probably well publicised to the authorities to aid his cause, but only after he'd moved on. 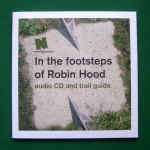 Yorkshire was an area that he used because of easy access using the higher level Pennine tracks away from the thoroughfare with reports of him visiting as far as Robin Hoods Bay near Whitby, but most of the landmarks are in Nottinghamshire. A Visitor Centre stands near to the Great Oak, a tree that was reputedly used by Robin as a hiding place. It is indeed a massive tree, impressive in itself, and easy to see how Robin and his men could have hidden away in it or any of the other gnarled trunks of ancient Oaks that stand in close proximity. Do not believe those that say it would only have been an acorn in Robin Hood's day since nobody actually knows when Robin lived or how old the tree is, so just imagine an encampment at its base with a lookout on a stump nearby. The Visitor Centre is fascinating with a permanent display, a chance to try out the stocks and a tea room, but for the best experience just walk around the woods at dawn as the light filters through the Oak trees and the forest comes alive - live the film. 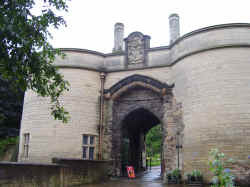 Nottingham Castle is the number 2 Robin Hood visitor attraction and can be coupled with a trip to the Robin Hood Experience in Nottingham. The Castle is a well maintained traditional Motte & Bailey with many stories connecting it with Robin and the infamous Sherriff of Nottingham. The Church in Edwinstowe is connected in that this is where Robin Hood married Maid Marrion, there are also other stories of the times he visited the village and church which was close to his main camping area.